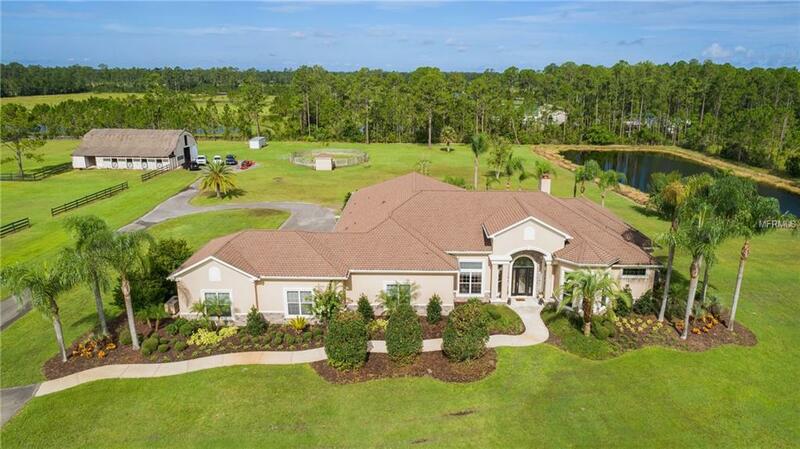 Stunning estate only 15 minutes from the beaches of New Smyrna Beach spanning almost 5,000 sq. ft. on one level & situated on 10 beautiful acres features 3 large bedrooms (could be 4 bedrooms by adding closet in game room) 4 full bathrooms & 1 half bathroom. 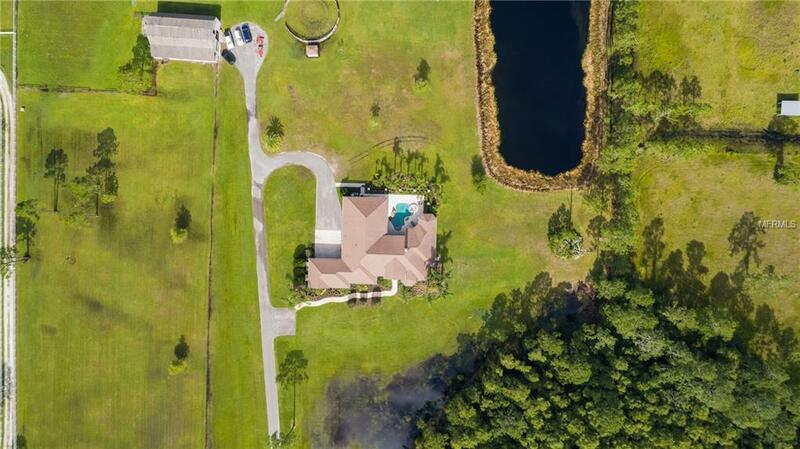 The lush 10 acres have been fenced allowing for pasture space, enjoyment space & also showcases a fully stocked pond. 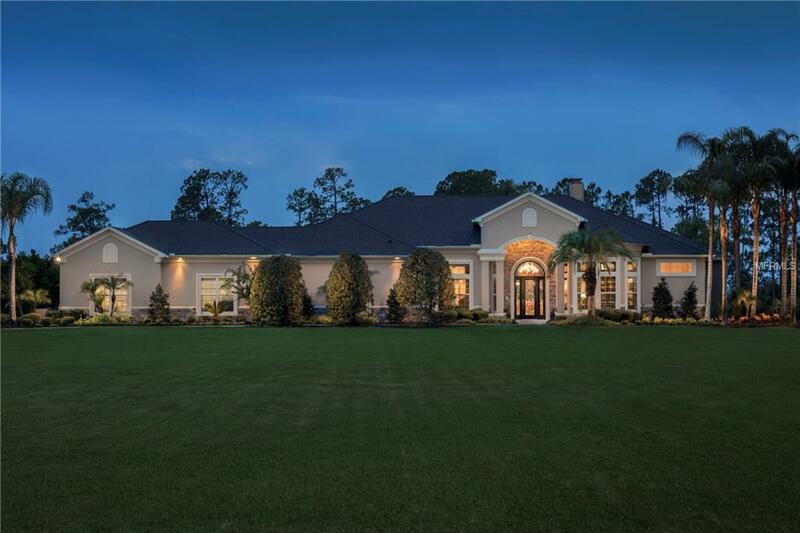 The interior has been finished with high end & one of kind features with soaring ceilings. A wall of glass with unobstructed view of your tropical pool greet you as you enter the home. The formal living room is anchored by the two story wood burning fireplace and intricate ceiling detail. Encompassing the entire right side of the home, the master retreat showcases a large bedroom with enough room for sitting space perfect for catching up on your favorite book or for just enjoying the peacefulness of your own private estate. The en suite bathroom is equipped with a top of the line shower with multiple shower heads and settings providing the perfect spa like experience. The main living areas of the home are open to each other and provide serene views of your pool from almost every room. Off the gourmet kitchen is a great wet bar with wine fridge. The kitchen is fully equipped for the most discerning chef & showcases exotic granite and one of the largest islands perfect for entertaining. Both secondary bedrooms are huge and feature their own private bathrooms. Bonus room with half bath could be great for a 4th bedroom by adding a closet.